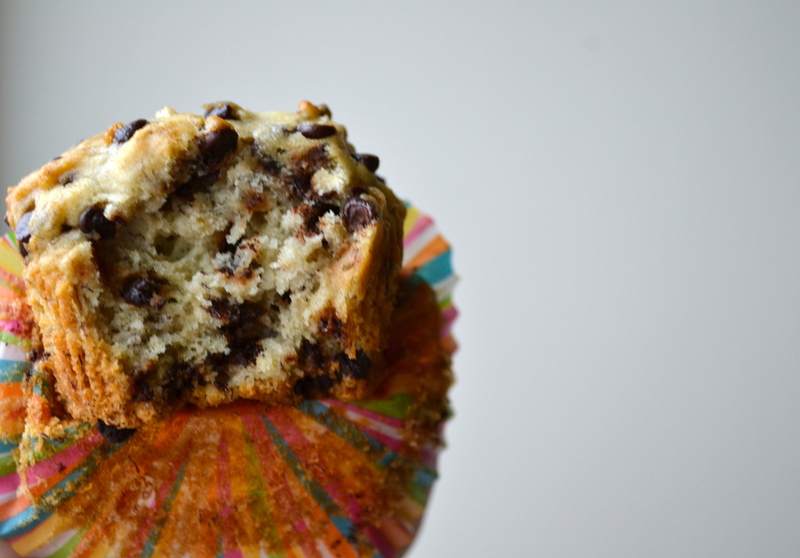 Banana Chocolate Chip Muffins | how 'bout some cake? Bananas are a staple at my house. I buy them a couple times a week and they’re usually gobbled up within days. But every once in a while one gets over ripe and nobody wants it so I’ll throw it in the freezer for a recipe like this. Waste not want not, amIright? These muffins are delicious, easy, and (from my personal experience) they make getting up painfully early just a little less agonizing. The recipe makes 12 perfect muffins that are good to eat immediately or freeze. The blog where I got the recipe says that they’re 100% foolproof. After trying them, I suspect this is true. They’re the perfect “I-don’t-really-bake-but-I-want-my-house-guests-to-think-I-do” recipe. So go ahead and bookmark it now. Mix the banana, sugar, egg and butter. If your bananas were frozen, they’ll be a bit watery. Don’t worry about it- the muffins will turn out fine. In a separate bowl, mix together the baking soda, baking powder, salt, and flour. Combine the wet and dry ingredients, then stir in the chocolate chips. Grease a cupcake/muffin pan, or fill it with fun colorful liners. Then drop equal amounts of the batter into each little section and bake for 20 minutes. Let them cool, then enjoy with butter or peanut butter… and, of course, a big cup of coffee! 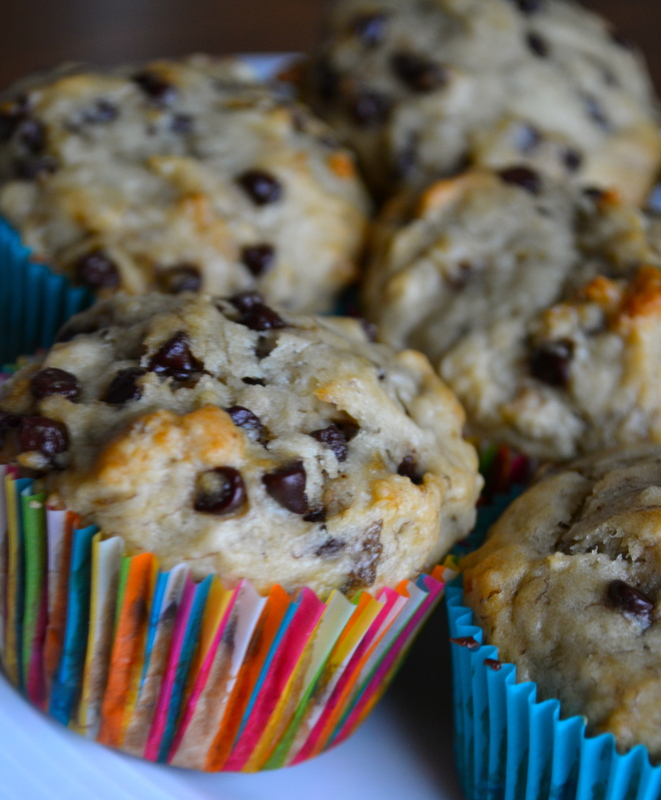 This entry was posted in Food & Recipes, Indulgences and tagged banana muffin recipe, banana muffins, breakfast, chocolate chip banana muffin recipe, chocolate chip banana muffins, muffin recipe, muffins, recipe. Bookmark the permalink. These look insanely delicious! 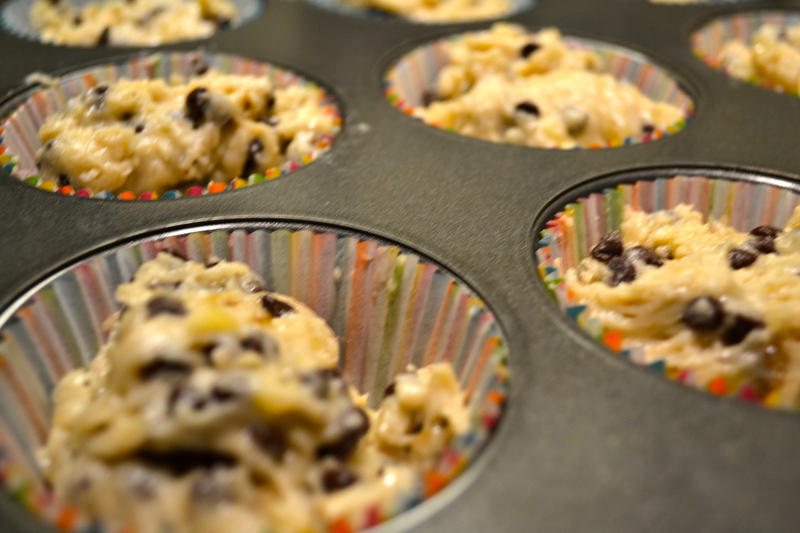 Chocolate chip banana muffins are my fav too (besides blueberry), so I can’t wait to try these out! I just raided my frozen banana stash to make peanut butter/ banana/ choc chip bread for Ben! Oh, I love that recipe! I should try making a muffin version of that!